NEW YORK, NY--(Marketwire - December 2, 2008) - The global hunt for The 39 Clues™, the groundbreaking multi-media adventure series from Scholastic, continues with "Book 2: One False Note" by Gordon Korman, on-sale today in the United States, United Kingdom, Australia, New Zealand, and Canada. In advance of today's release of "One False Note," kids around the world participated in a live global webcast on December 1, 2008, with Academy Award-winning actor Whoopi Goldberg interviewing author Gordon Korman. The webcast can be viewed online at www.scholastic.com/39clues. -- Arena 39, a new training area on The 39 Clues online game where participating Cahills can test their clue-hunting skills, launches with five different mini-games. Each week, there will be a new challenge available and players will be able to continually view their overall scores. -- "The 39 Clues: Double-Cross™" is a free card game in which kids can use their 39 Clues collectible cards and play against their friends without having to go on the internet. A free instructional video, downloadable game mat, and rules are now available on www.the39clues.com. The "offline" adventure begins with players sending their "agent cards" out into locations to collect Cahill secret information and earn points. 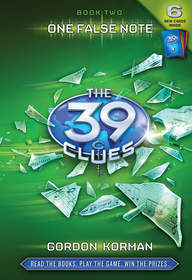 "The 39 Clues: Double-Cross" is designed for 2-4 players, and the first to collect 39 points wins. -- From now through December 24th, 39 Clues television ads will air in New York, Los Angeles, San Francisco, Atlanta, and Washington, DC. -- Scholastic has created a special Classroom Guide for educators that can be downloaded from www.scholastic.com/39clues. The 39 Clues is a reading adventure allowing students to visit every continent and travel through 500 years of world history. The 39 Clues launched on September 9, 2008, with "Book 1: The Maze of Bones" by Rick Riordan, which debuted at #1 on the New York Times bestseller list, and has remained on the list for 10 consecutive weeks to date. This groundbreaking multi-media adventure series for ages 8-12 spans 10 adrenaline-charged books, multiple collectible game cards, and an online game that allows readers to play a part in the story and compete for prizes. 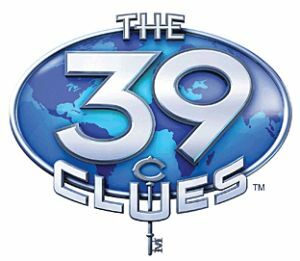 The 39 Clues online game also launched in September with children from all 50 states and in countries around the world logging on to join the hunt. Also available now is The 39 Clues Card Pack 1, a collection of 16 game cards that can be used for Books 1, 2, and 3. Movie rights for The 39 Clues have been acquired by DreamWorks Studios with Steven Spielberg eyeing to direct. "We are thrilled that readers around the world are actively engaged in the multi-media hunt for The 39 Clues," said Ellie Berger, President, Scholastic Trade Publishing division. "So far, the online game has attracted participants from all 50 states and from more than 100 countries -- extending the reading experience to all those who accept the challenge." The 39 Clues centers around the Cahills -- the most powerful family the world has ever known. But the source of the family's power has been lost. Grace Cahill, the last matriarch of the Cahills, changed her will minutes before she died, leaving her descendants an impossible decision: receive a million dollars or a clue. The first Cahill to assemble all 39 clues hidden around the world will discover what makes the family so powerful -- a reward beyond measure. It's Cahill versus Cahill in a race to the finish, with readers hot on the heels of the main characters, fourteen-year-old Amy Cahill and her eleven-year-old brother, Dan. The series kicks off in the first book with Benjamin Franklin taking center stage in "The Maze of Bones"; and in "One False Note," the focus shifts to Wolfgang Amadeus Mozart. Gordon Korman is the author of more than sixty books for kids and young adults, most recently "Swindle" and "The Juvie Three." His writing career began at the age of 12 when his seventh grade English assignment became his first novel, which was then published when he was a freshman in high school. Now, thirty-two years later, he is a full-time writer, with more than 14 million copies of his novels in print. His books have been translated into 14 languages. Each year he travels extensively, visiting schools and libraries, bringing his trademark humor and adventure style to readers everywhere. A native of Ontario, Canada, Korman now lives with his family in Long Island, New York. For more information about The 39 Clues and to download digital images, visit http://mediaroom.scholastic.com/The39Clues. *NO PURCHASE NECESSARY. Void where prohibited. For complete details and Official Rules, go to www.the39clues.com. Scholastic Corporation (NASDAQ: SCHL) is the world's largest publisher and distributor of children's books and a leader in educational technology and children's media. Scholastic creates quality educational and entertaining materials and products for use in school and at home, including children's books, magazines, technology-based products, teacher materials, television programming, film, videos and toys. The Company distributes its products and services through a variety of channels, including proprietary school-based book clubs and school-based book fairs, retail stores, schools, libraries, television networks and the Company's Internet Site, www.scholastic.com. From December 2nd through December 24, 2008, 39 Clues television ads will air in New York, Los Angeles, San Francisco, Atlanta, and Washington, DC. 'One False Note' by Gordon Korman, the second book in The 39 Clues multi-media series, is on-sale December 2, 2008.